Is there anything better than a refreshing rosé spritz on a balmy summer evening? Well, you can only do better by wearing a matching outfit. Luckily, the Pantone Color Institute named soft pink tones as it-colors of this spring/summer season. The blush tone “Blooming Dahlia” comes in perfectly for summer because of its warm shade. This is also what makes the color flatter every skin tone. Labels like Acne Studios or Vivienne Tam prove how the trend tone works for monochrome looks. Also some simple accents can elevate every outfit on a summery higher level. Moreover, “Blooming Dahlia” goes perfectly with straw bags or straw hats, which are returning summer must-haves for every season. 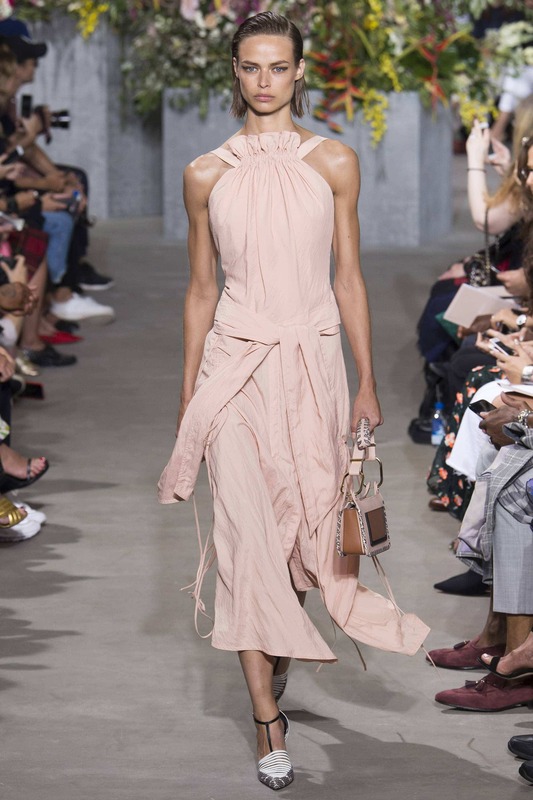 So while it might be a bit too early to enjoy your glass of rosé on the rooftop terrace, why not already integrate it into your wardrobe instead? Cheers! Another must color this season is a muted pink tone with a dash of lilac. The Pantone Color Institute calls it “Almost Mauve” which reminds of the malva flower. Apparently, the French version mauve would sound a bit more elegant. The delicate color makes the perfect companion for this season because you can wear it in various exciting combinations. At the same time, “Almost Mauve” is an ideal alternative to pink because it’s not that vibrant. So the tone comes up with a rather feminine and soft attitude, which goes with fluid materials such as tulle or silk. However, never underestimate its sophisticated side, which may show up as a summery blazer version. Last but not least, rose tones are considered to spread an atmosphere of a positive sensibility. In turn, this attribute makes us feel those happy and loose vibes. So there could definitely be no better first days of summer than starting them off with a happy outfit and a smile on your face. 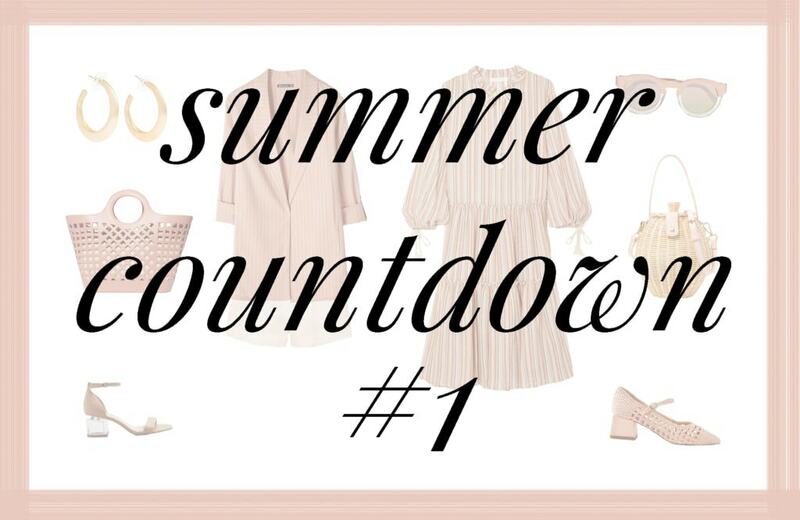 Let the summer countdown begin! Posted in Trendy Tuesday and tagged Accessories, Fashion, Inspiration, Pink, Rose, Spring Summer 2018, SS18, Style, Summer, Tips, Trend. Bookmark the permalink. Wooooow, die beiden Farben und die Kleidungsstücke sind einfach absolut zauberhaft! Einfach genau das Richtige für den Sommer! Oh ich danke dir meine Liebe! Vielen Dank für deinen Kommentar! Blooming Dahlia is a gorgeous colour! I am glad you like it Chloe! thank you very much for your feedback! Oh thank you very much for your feedback Ashley! I’m really loving this blush and rose pink red this season! Such an adorable shade. Oh that straw bag from Ulla Johnson is pure summer love!! Need it! Oh vielen Dank meine Liebe! Ach nein, zum Glück gibt es ja so viele verschiedene Farbtöne! That jason Wu look is so good!!!! Oh yes, such a great inspo right? In love with these blush hues!! Ganz tolle Inspirationen, ich liebe diese Farbtöne! Oh vielen Dank für deine lieben Worte Jimena! Oh glad this post could inspire you dear!